Keep Getting the Lead Out – It's the Law! Read The Nonlead Tackle Advantage and learn more about the excellent tackle you can now use instead of lead. Please take note: The laws prohibiting the use and sale of certain lead sinkers and jigs have changed to include all sinkers and jigs with a total weight of one ounce or less. Common Loons and other waterbirds can die from lead poisoning after accidentally ingesting lead sinkers and jigs. Current state law prohibits the use of lead sinkers and jigs with a total weight of one ounce or less in all fresh water in New Hampshire, including lakes, ponds, rivers and streams. Lead sinkers and lead jigs shall not include lead fishing related items including but not limited to lead core line, spinnerbaits, buzzbaits, spoons, poppers, plugs, or flies. 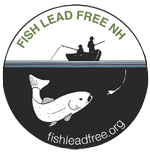 The law also prohibits the sale in New Hampshire of lead sinkers and jigs weighing 1 ounce or less. These laws prohibiting the use and sale of certain lead sinkers and jigs are designed to reduce Common Loon mortality due to lead poisoning. by the Loon Preservation Committee. Gear up for prime fishing time and pay a visit to your local tackle shop for the latest selection of nonlead jigs and sinkers. A few years ago, lead tackle was standard. Now we know that lead is a toxic substance - a health hazard for both people and wildlife. Luckily, today you can find vast array of inexpensive alternatives to lead tackle that offer technical benefits to the angler while keeping our waterways lead-free. Fish and Game tackle titan Mark Beauchesne notes that many nontoxic materials such as steel, brass and bismuth are harder than lead and are less likely to get hung up on rocks. Some tackle materials are denser than lead, which gives them a smaller profile; also, some have a lower melting point, which allows for much finer detail. Nonlead tackle also makes a real racket underwater - a huge benefit to anglers. Beauchesne notes that fish pick up sound vibrations through their lateral line, and use them to locate prey - so a product whose sound travels a long distance when bounced off the bottom is a sure-fire fish attractant. A top noisemaking choice is a "brass-and-glass" combination - a glass or plastic bead between a swivel and a sinker. Ingesting lead can kill a Common Loon in a matter of weeks. Lead sinkers and jigs account for 48 percent of mortalities among adult loons, by far the largest single cause of adult Common Loon mortality in New Hampshire. Read more about adult Common Loon mortality from ingesting lead sinkers and jigs at the Loon Preservation Committee web site. For copies, call Fish and Game's Aquatic Resources Education at (603) 271-3212. Use non-lead sinkers and jigs. It's the law. Ask your local sporting goods store to stock non-lead fishing tackle. Spread the word. Tell other anglers about the problem with lead. All Fish and Game regional offices (Concord, Durham, Keene, Lancaster, and New Hampton). Household Hazardous Waste Collections held throughout the state. Call the NH Department of Environmental Services at (603) 271-2047, or visit www.des.state.nh.us/hhw for more information. The Loon Preservation Committee's visitor center at 183 Lee’s Mill Road in Moultonborough. Visit www.loon.org.